Nadiya Savchenko’s book was presented at the publisher’s forum in Lviv; she is a Ukrainian soldier currently imprisoned in Russia. Vira Savchenko speaking at book launch in Lviv of her sister, Ukrainian pilot and MEP Nadiya Savchenko’s book, written in Russian prison while on a hunger strike protest of her kidnapping, abduction to Moscow and being held illegally, now for over a year. Screenshot from video (in Source link below). In Lviv, at the publishers’ forum, prisoner Nadiya Savchenko’s book, “It’s A Strong Name, Hope” [‘Nadiya’ translates to ‘Hope’ in English] was presented by the Justinian Publishing House [who publish primarily books related to law]. She wrote the text in the Moscow prison during her hunger strike. She handed over the curled-up pages to her lawyer, smuggling them inside her ears and hidden in her clothes. A documentary about Ukrainian pilot Nadiya Savchenko’s capture was also shown during the book presentation. “Dear Readers, my apologies that this book is not written in a lofty style. 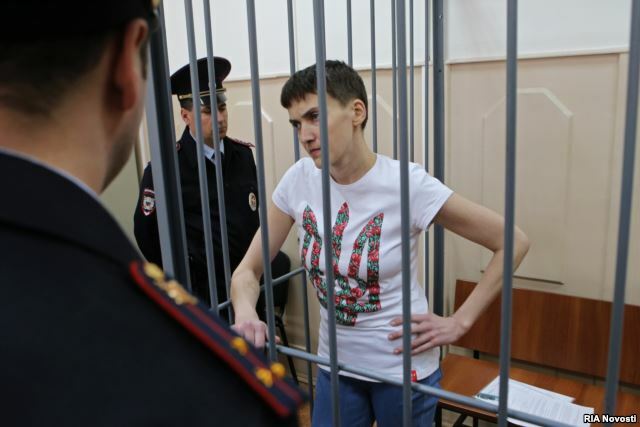 But, as they say, ‘a word dropped out of a song makes it all wrong.’ So I have written simply, conversationally.”–were the words Nadiya Savchenko wrote to her readers. [Read Chapter 1: Iraq here]. Nadiya’s sister – Vira [which translates to ‘Faith’ in English] – explained during the presentation that Nadiya started writing the book in Moscow, during her hunger strike, and that she was inspired to [carry out] this labor by [her] lawyer and Russian human rights activist Ilya Novikov. “She said to him – fine, you can have your book, because I want to die. She had already been on hunger strike then for over 40 days. Nadiya wrote a book very quickly [in the video Vira says it took Nadiya 2-3 weeks], but it took me a long time to type up the texts. She carried shreds of written pages in her ears. There are even traces of medicine [on the pages], because she had an ear infection at the time. The chronology of her book – is war, battle, captivity, kidnapping, prison, and hunger strike, followed by Nadiya’s vision for a modern Ukrainian army; she writes about the peacekeeping mission in Iraq, about the events in Crimea and the early days of the ATO [anti-terrorist operation],” – says Vira Savchenko. This is a very real, very sincere chronicle, written like an exposed nerve, said the presenters. The book editors tried to preserve Nadiya’s style and emotions. “I decided it was better to write it once, than to repeat it a hundred times. Time to start work.” – Nadiya wrote in her Foreword to the reader. “Nadiya wrote this book for the sake of truth. This book is worth reading now. No need to exalt Nadiya herself, she asked everyone not to. [The book] describes how they treated her in captivity. When Nadiya was detained, I went to Luhansk, twice. I was also detained. When taking her prisoner, they beat her with the gun stock of the gun. When Savchenko’s case gained worldwide publicity, when she was already in Russia, then they started treating her better” –retold her sister. Nadiya Savchenko describes that when she had already been on hunger strike for 50 days, the prison guards purposefully roasted potatoes near her cell, so that the smell would carry everywhere, and make her stop her hunger strike. For several days, the Ukrainian pilot tolerated the [guards’] insults thrown at her for speaking Ukrainian, [in the guards’ words] a “dog’s” language. “While, in the cell, I imagine that I’m not in prison at all, but at home, simply not leaving the apartment… I do things, I read, I write … And then I see the jailers and the prison cells, and immediately remember where I am …” – Nadiya Savchenko writes. According to her sister, Nadiya did not specify who should receive the first copies of the book, since it’s meant for the readers. “I want the book to make it to the West, so that everyone in the world knows about the situation in Ukraine. Petro Poroshenko [President of Ukraine] does not have this book, I only gave a copy to Yulia Tymoshenko, as Head of the party faction [i.e. 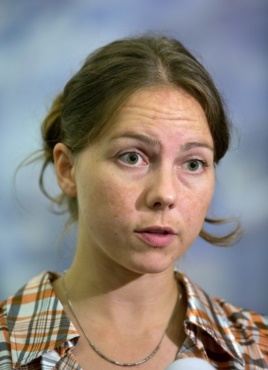 : the Batkivshchyna Party in which Nadiya is an MP] when I was told about [doing] this “– said Vira Savchenko. Vira last saw her sister in August in Rostov-on-Don [Russia]. Nadiya herself will have to learn from Vira about the presentation of her book in Lviv and readers’ impressions of it. She will only be able to hold the book in her hands when she is released and free. “I only wrote the truth that I know, the one I saw through the prism of my own eyes, relying on what remains of my own memories. Whatever I did not mention wasn’t worth the attention! Life will go on! Life goes on.”–with these words Ukrainian pilot Nadiya Savchenko ends her book. After Lviv, a presentation of the book will be held in Kyiv. This entry was posted in #Free Savchenko, English, English News, Pictures, War in Donbas and tagged #FreeAfanasyev, #FreeChigoyz, #FreeDegermendzhy, #freekohver, #FreeKolchenko, #FreeKostenko, #FreeSavchenko, #freesentsov, #RussiaInvadedUkraine, #StopRussianAggression, #UkraineUnder Attack, Kremlin, Russia. Bookmark the permalink. 3 Responses to Nadiya Savchenko was smuggling the pages of her book in her ears. please, i would like to know if her book has been translated in english, french or spanish – i would like to buy it !! thank you – and …. long live ukraine !!! and her !!! !